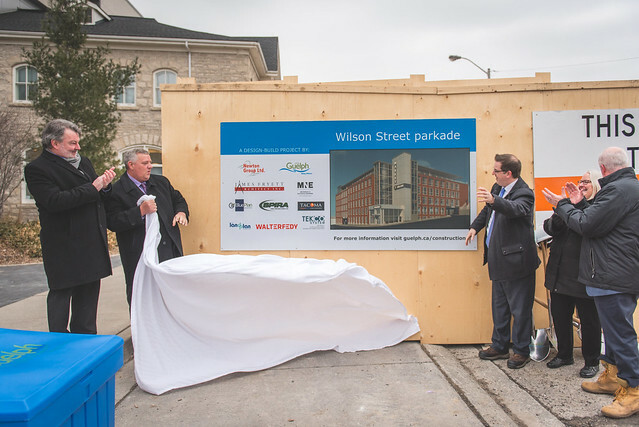 The Wilson Street parkade is the first parking structure to be built in Guelph in 30 years. It will start to address the current shortage of available parking spaces in Guelph’s growing downtown and is one of the first steps to implementing the Parking Master Plan. Building a parkade in the Wilson Street parking lot, located at the southwest corner of Wilson Street and Carden Street. The parkade will have a minimum of 350 parking spaces, be a maximum of six levels tall and include bicycle parking facilities, electric vehicle charging stations and elevators for improved access, including access to the Norfolk pedestrian bridge. Replacing the aging pedestrian bridge over Norfolk Street, located between Waterloo Avenue/Wilson Street and Macdonell Street. The Wilson Street parkade will start to address the current shortage of available parking spaces in Guelph’s growing downtown. This parkade is one of the first steps to implementing the Parking Master Plan. Review design-build RPF submissions: September 2016 2016 NOTE: The four proposals received through the RFP significantly exceed the approved budget. As a result RFP 16-135 was canceled and a new RFP will be re-scoped and re-issued. Read the Wilson Street Parking Structure – Contract # 16-135 Update report for details. Phase 3 of Wilson Street, the completion of the surface works from Gordon to Northumberland Streets has been integrated into the Wilson Street Parkade RFP to be completed during that construction project. It is anticipated that the whole project, including the Wilson Street parkade and on-street reconstruction, will be complete by the fall of 2019. Council approved the design-build contract of $20.4 million for the design and construction of the Wilson Street parkade and related street work, including replacing the pedestrian bridge over Norfolk Street. Every effort will be taken to ensure the construction of this project minimizes impacts on local residents, businesses and downtown parking. Sections of Wilson Street and Northumberland Street will be closed to vehicular traffic during construction. Pedestrian and cyclist access along Wilson Street will remain open throughout most of the project. The detour for traffic accessing the downtown core is to continue north along Norfolk Street to Macdonell Street. Access to the Norfolk Street footbridge will be closed. People walking will be able to access the ramp to the sidewalk on the west of Norfolk, and can then walk north to Macdonell, or south to Waterloo, to cross Norfolk safely with a traffic signal. The recommended detour for people on bikes is via Fountain, Wyndham, and Macdonell Streets. This detour is signed. People on bikes can also travel in the northbound lane on Norfolk Street. Motorists are reminded to share the road. Check back here for updates on construction impacts throughout the project. Please provide your written feedback using the contact information listed under the Contact tab. This panel shows a massing view of the Wilson Street Parkade facing south down Wilson Street. The corner of the building at the intersection of Wilson Street and Northumberland Street is shown as a curved wall that is intended to form a key signature architectural element. The main entrance lobby to the parkade is shown below the curved wall at the ground level.